Ancient Greece has always fascinated me. I studied their language in high school, and this year I visited Greece itself. And although I've been fond of their architecture since a long time, I was impressed by everything I saw there . People say that Greece is just a pile of ancient rocks . But I say that pile of rocks is quite a sight . This inspired me to build some columns in Lego. The Dorian order is very typical for Greece, but not much of a challenge for Lego . I had a go at the Ionian order, but that turned out way too big. Spirals are really hard to do. I was left with the Corinthian order. Although not the most typical for Ancient Greece, the design fascinates me. With the acanthus-leaves, it looks like a tree. It makes temples look like an extention of nature. Not a better thing to do if you want to provoce the super-natural, the divine. So this is what I came up with. The model consists of 412 bricks. I wanted to make it more or less in minifig scale, and I think I managed that . The tooth pieces (part ID 49668) made nice leaves, and the rest followed. The problem was fitting as many as possible in a small space. The eight-bar-rings (part ID 75937) prooved to be pretty handy. I used three of them in the capital, and one in the base. It really is the heart of this model. The actual column was rather hard to make. 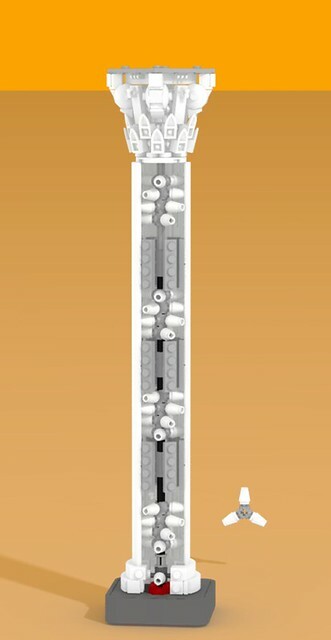 The technique from the Lego website made a column with eight tiles forming a cilinder. That was too small. I ended up with twelve tiles, connected by the cross/steering wheel/winch handle/I-don't-know-what-to-call-it-piece (to make things simple: part ID 48723). It turned out quite well, although I have some minor doubts concerning the strength of the construction. I'm not too happy with the base , but that's not the main focus, and perhaps the pillar should be a little longer. But that shouldn't be too hard to change, and it had to fit on the picture anyway. I really like the head of your column. Is it possible to make a picture with a minifig standing close to it? It looks really good and I can imagine a structure that had many of these supporting a roof would look fantastic - I'm just not sure how it'd handle bearing a load! Brilliant MOC. I especially like the top section of the column. Your design of the capital is interesting, but I think that you should add... something to the top. Not sure about the English word for it, see wikipedia capitals pic: on the Corinthian one, it's the border above the volutes where there is a little flower piece on that example. Without it the column is not finished in my opinion. And I'd reverce the dish pieces (depicting volutes) so that the stud wouldn't be seen. Very clever and well thought out. I really like this. Corinthian columns are definitely a challenge and you have done some great work. Would a large radar dish work on the bottom? Not sure if they make an 8x8. What you have on there looks to gappy. Fantastic design anyway. I may have to "borrow" your technique for something I am working on. This and the other MOC which uses the animal horns in it are the best corinthian columns I have seen to date. It was very clever of you to use the pirate steering wheels / capstans as the core of your column, to achieve the studless look. 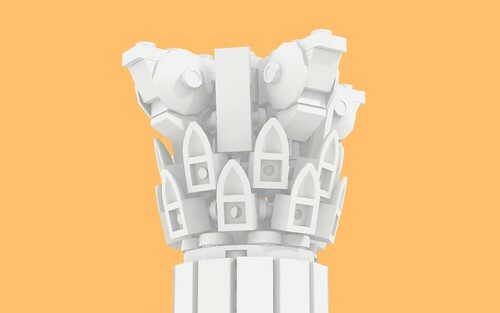 The head of the column is also very well thought out - it looks great! Looks very nice with the tooth pieces! I agree. The design looks fantastic! Yeah! That is something I like! As a former student in architecture I really appreciate how you managed to capture the styles in a "legoish" way. It would be awesome if someone make a whole building with these! Your research defenitely worth it! My only bemol is with the inner body. Maybe (and it's difficult to tell when you have not made it) you could save some pieces by using other type of connection or at least only three, at the base, the middle and the top. Anyway, I will not complain anymore. Well done! Wow this is an incredible design! Great part use for the interior of the column. I really appreciate your interest and comments.Thank you! As you can see in the picture, I added the extra layer on top. This was a surprisingly hard section: I struggled with bows slopes, complicated plate structures... but in the end, the solution was quite simple: just a 4x4 plate set at an angle of 45 degrees did the job. It's not very refined, but at least the idea is now present, and quite effective too. Thank you for this remark! As for the dishes: I tried inversing them, and that was not possible without altering the whole structure. Besides, the stud at the inside is even bigger, and the volutes on Greek columns tend to have a slight outward curve. That's why I kept it as it was. Your comments reminded me I had forgotten the small volutes in the middle of each quarter. It was fixed in no time: I replaced the 1x3 tile with a 1x3 tile with click hing on top (that is one piece). This simple replacement looked quite effective. Would a large radar dish work on the bottom? Not sure if they make an 8x8. What you have on there looks to gappy. I had tried something of that sort already, but the downward curve was just too big. The base of a Greek column usually consists of a pile of concentric circles. Also, it disturbed the look of the column: something smooth and curvy didn't seem in place with all those angled bits. I couldn't find any other solutions yet... cause I agree with the base being too gappy. Yes, it's going to be quite expensive, because of the high piece count. But I've seldom seen a really large temple MOC with lots of columns, so I guess working with columns is just an expensive business . hat doesn't prevent me from building one digitally however... So I begun with this little layout, demonstrating a way to connect several columns. It doesn't look that bad, so in time, I might give it a go. The column (without the cushion it's sitting on) is about 28 brick-heights high, clocking in at 26,88 cm (10.6 inch). In the new picture, you can see it in scale with a minifig. My only bemol is with the inner body. Maybe (and it's difficult to tell when you have not made it) you could save some pieces by using other type of connection or at least only three, at the base, the middle and the top. I've given the inner body many thought. Connecting the tiles to the inner bar in just a few places would certainly save some parts. In that case however, you have to connect the tiles of one vertical row to each other, in order to insure sturdiness and to prevent the tiles from tilting (that happens if you connect them in only one place). Connecting the tiles at the inside is impossible however. As far as I know, there simply isn't enough room to connect them. Besides, the cross-pieces are just a little bit more than 1 standard technic bush. So you have to let some room between them. That limits your possibilities severely. So yes, the sturdiness of the construction could prove a problem. And no, I don't think what you propose is feasible. But since it's only a digital model for now, that doen't bother me a lot. I hope you enjoy the improvements! Thanks, I appreciate your appreciation ! I used the good old Lego Digital Designer to make the model digitally. But rather than taking a simple screenshot, I rendered the model using LDD2PovRay (link to the EB topic / link to the website). This software, developed by EB meber Hrontos, enables you to make photo-realistic renders of LDD models. You need 3 programs: LDD, PovRay and LDD2PovRay. I use it for all of my renders, and it looks really good. The pictures in this topic are just rendered on the lowest quality: without bevels or the LEGO-logo on the stud. I do this because my computer is quite slow. So go on and download it: it's free! Thу top of the capital is now much better! I installed these three programs but when i try to run the .ini file generated by LDD2PovRay, it says "Parse error" how can I fix this? really great design! so who is the one who puts this into real bricks? Wow! Excellent technique and genius design! Great renders too! I love the tooth pieces and the technique used to make it round! It looks fantastic with two of them next to each other too! This is an excellent design. The detailing on top of the pillar is fantastically done. It would be great to see it used in a real building. Have you tried building it with bricks? How stable is it? I'm glad you like it. I haven't built it for real however. I'm just a student, so my LEGO-budget is on the low side. Moreover, my collection of bricks is pretty outdated, and I love my recent sets too much to take them apart . That's why I build everything digitally. I don't think it would be very stable, because the spine of the build is actually a long flexible tube (I couldn't use Technix axles because the crosses are rotated 45 degrees). 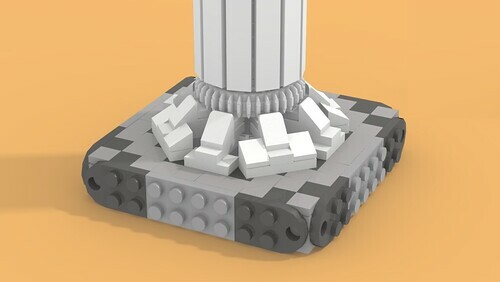 The tiles on the side could give some additional support, maybe enough to keep the column standing, but not enough to support anything else. So my guess is that if you connect it to an additional support structure (like a wall of a temple), or if a lot of these columns actually support each other, you could make a building. I'm not an expert in this, but you should ask your question in the EB topic. It would help if you provided those helpful guys with some additional information. Thanks again everyone for your kind remarks! Hello everyone, I'm back with an update! 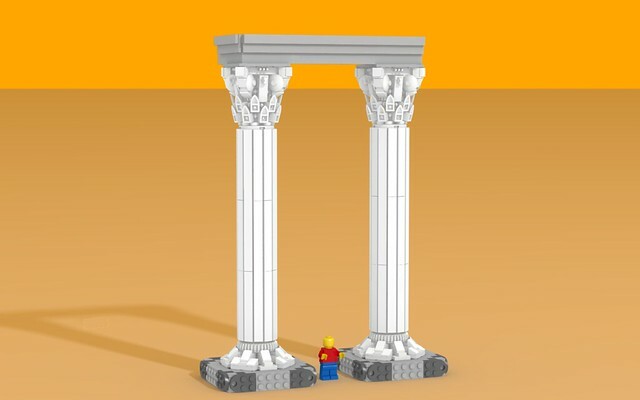 When I presented the first version of this MOC, most people had their concerns about the stability of the column. I found those doubts reasonable, so I revisited the model. Now, things should me much more stable . 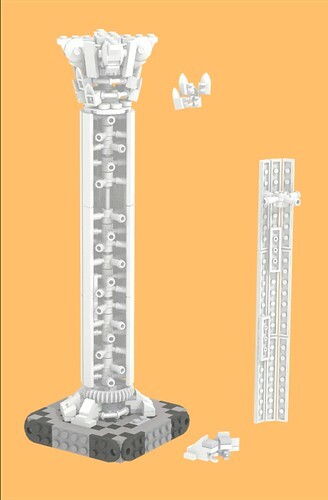 The spine consists of Technic axles, while some of the outermost tiles are connected to each other (in the height) to provide extra support. Tha magical part that made this all possible was the Technic bush with three axles (part nr. 57585). Since you have to turn ech piece 90 degrees in order to connect to twelve panels, it fits around the technic axle (unlike his predecessor which was set at 120 degrees). The connections are made with regular 1x1 cones (part nr. 4589b). Since I was revisiting this model anyway, I decided to rework the base as well. Now there are no more gaps and it looks much rounder . 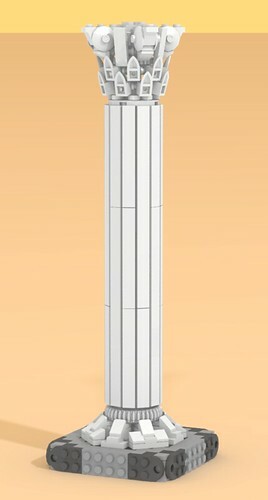 Finally, I changed the height of the column to get the proportions between the capital and the height right. This can be easily modified however. All that's left to say is that the piece count (relative to the height) has dropped , making it more realistic to build (I've checked it: all parts are available for purchase. That's about the first time that happens! ). So thanks every one for the kind comments, and for pushing me further on this project. Now I'm really convinced a temple could be made IRL with these columns . I love the improvements. I'm definitely going to have to borrow this technique! Nice parts usage! Great design!